I know for many of you, it's summer break and the LAST thing you want to hear about is school. My summer break literally just started, so I know I'm in that boat too! During my first year teaching Kindergarten, my morning was CRAZY! I didn't get to school any earlier than I needed to. I never planned anything for morning work the day or week before. I would get to school 15 minutes before kids started arriving, print a random worksheet, rush to the copier (which was ALWAYS packed of course), make 20 copies, and rush back to the room, just in time for the kids starting to come in to eat their breakfast. Then, I would have to help open their breakfast, make sure they weren't spilling their milk everywhere, and help the students unpack backpacks. Once students would start whatever morning work I found, they would start calling for me, asking for help and what to do. After they finished and turned in their work, then would come the "Now, what?" questions. Once 8:00 came around, we needed to get our day started. Half the students hadn't finished the work, so they had to put it in the unfinished work bin. It wasn't quite fair for the students who came in later, due to bus schedules or parents dropping them off late. I needed to find a solution. My mornings started out hectic and I quickly learned that this was not going to work. While on Pinterest, I saw this idea to reuse worksheets like handwriting, and number practice with clear sheet protectors. Then, it clicked. I made a bunch of handwriting, number practice, sight word pages and put them in the clear sheet protectors. I put them in 3 prong folders, and set out dry erase markers. The next morning when the students came in, they were able to get right to work! My idea has evolved into the Morning Work Binder. 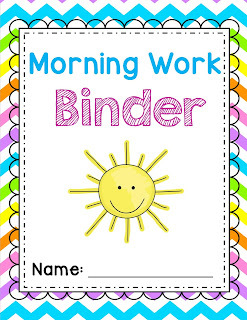 The Morning Work Binder has handwriting pages, sight word and phonics practice pages, number practice, sentence writing. I even added an Interactive Calendar Journal to help revamp my Calendar time. I use 1/2 inch binders and sheet protectors, rather than laminating. I always ask the parents to donate sheet protectors and I had bought a class set of 1/2 inch binders for this purpose. A few sheet protectors may have to be replaced throughout the year, but there is minimal upkeep involved. I did not print out every single page, but rather focused on handwriting, writing their name, sight words, and numbers for the beginning of the year. Halfway through, I added the hundreds chart, calendar, word families, and phonics pages. I also have additional "worksheets" that I would pull on some Fridays, or if we had extra time that morning to work. If you have parent volunteers, this is a great job for them to do in the beginning of the year. Or this would be a great summer project for you! First of all, strong classroom management and procedures go a LOOOOOOONG way when working through your day. In the beginning of the year, I have everything planned out to the minute and procedures to go along with every part of the day. So, when implementing your Morning Work Binder, you have to have a SOLID procedure. It will save a lot of time answering silly questions or students being off task. Here is my morning procedure with the morning work binder. 1. Students come in, greet the teacher, and unpack their backpack. 3. Students get a black expo marker and start working. 4. When it it time to start the day, they will have a 1 minute clean up timer. They will clean up their binders, put them back where they belong and make sure they close up the marker caps tightly. Last, they will sit on the carpet. -If they have questions about what to do, they "Ask 3, then me". There is always a student who can help them, before they ask me. -If they finish, they either do the page again, for example the handwriting pages can be erased and worked on again. Or, they make work on a handwriting or numbers page. Sometimes I will write a "Must Do, Can Do" on the board. *Must Do: Sight Word of the Day- the. It's Kindergarten and it will take time and patience until the students are able to work on it independently. Be patient and be flexible. I didn't start using it until about 2 weeks into the school year. I wanted the students to be "pro's" at their morning procedure. Adding the Morning Work was easy. The first day I showed them the binder and explained why they would be working on it everyday. They were SO excited to use Expo markers and to get their own binder. We flipped through the pages and talked about what to do on each page briefly. Every day, I would show them how to work on a new page during our Reading Whole Group time. We would work on it together a few times, answer any questions they had, and quickly go over the procedure. The next morning, they would do that same page from the day before. By this time, they were able to do it almost independently. This process took about 2 weeks, but after those two weeks, they were pros! After using this for the past three years, my morning routine is structured and calm. I am able to take attendance, talk with my students, test weekly sight words, and do any last minute things before my day starts. Click on the pictures below to see the Kindergarten and First Grade Morning Work Binders on Teachers Pay Teachers. It is on sale until Thursday June 22, so grab it now for $2 off!